FAP-303 at Tocumen Air Base. N254AW at Vernon - CYVK, British Columbia. • 57-6121 United States Army. Delivered 12-Apr-1958. Designated as U-1A.. Initially delivered to Addison, TX., for radio work to be done by Collins Radio Corporation. Jan-1962. Attached to the 110th Aviation Company, Boscomantico AAF, Verona, Italy. Jan-1963. Headquarters Company, 3rd Support Command. Gibbs Barracks, Frankfurt. Germany. Mar-1964 To depot level maintenance, perhaps at Coleman Barracks, Mannheim. and transport back to the United States. Feb-1966. Joined the Inter American Geodetic Survey (IAGS) based at Howard AFB, Panama, conducting survey work in Central and South America. May-1970. Returned to Panama for storage. Nov-1970 Passed to Fort Eustis, VA., where it served as an operational support airlift aircraft. August 1972. To Panama, entrusted to the Logistics Support Command. Actual location unknown. • FAP-303 Sep-1972. Transferred to the Fuerza Aérea Panameña (FAP) under a Military Aid Program of the US government. based at Tocumen Air Base, co-located with Tocumen International Airport, near Panama City. • HP-1070 Patricio Janson, Panama City. Date unknown. Total time: 4,072 hours May-1986. Airworthiness date. 03-Nov-1986. Standard – Normal. • N254A Lyle E. Goodwin of Titusville, FL. Feb-1987. • N254A Rainbow King Lodge Inc., Iliamna, AK. Regd Feb-1989. • N254AW Thomas J.& Katie J. Prijatel, dba., Alaskan Wilderness Outfitting Company Inc., Cordova, AK. Regd 31-May-1991. Otter 254 was delivered to the United States Army on 12 April 1958 with serial 57-6121 (tail number 76121). It was one of sixteen Army Otters flown from Downsview to Addison, Texas for work on them by the Collins Radio Corp, so that they could operate overseas. Most of these Otters were assigned to Europe. 76121 was delivered to the 202nd Aviation Company at Boscomantico, Italy, part of SETAF, where it served until the unit disbanded in January 1961 and it was then attached to the 110nd Aviation Company, also at Boscomantico, until January 1963. It was then transferred to the HHC, 3rd Support Command at Karlsruhe, Germany until March 1964, when it went for depot level maintenance and transport back to the United States. In February 1966 it joined the Inter American Geodetic Survey (IAGS) based at Howard AFB., Panama. It was painted into the white and red colour scheme and carried out survey work in Central and South America until May 1970, when it returned to Panama and was put into storage there. In November 1970 76121 was taken out of storage and flown from Panama to Fort Eustis, Virginia where it served as an operational support aircraft, still in the white and red colour scheme it had used with the IAGS. It remained based at Fort Eustis until August 1972 when it returned to Panama, entrusted to the Logistics Support Command. The following month, September 1972, it was one of five US Army Otters transferred to the Fuerza Aérea Panameña (FAP) under a Military Aid Program of the US Government. With the Panamanian Air Force it took serial FAP-303 and was painted into the FAP’s grey colour scheme with national markings. The FAP Otters were based at Tocumen Air Base, co-located with Tocumen International Airport, near Panama City. 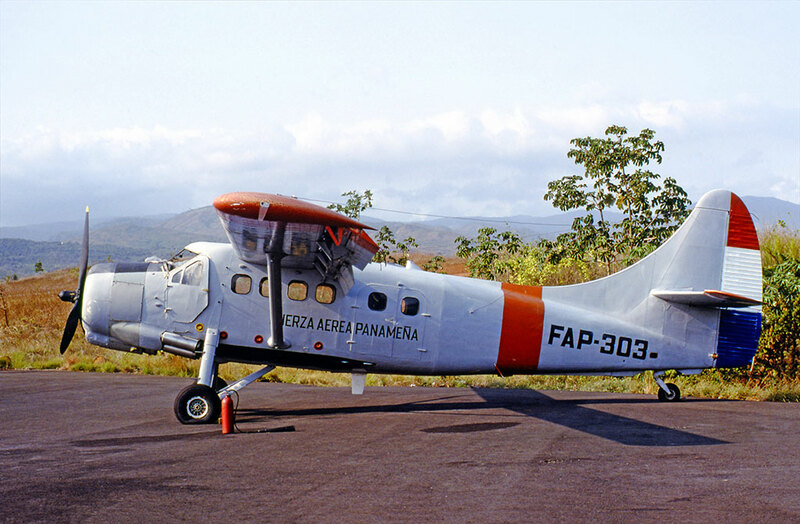 FAP-303 survived its military service in Panama and was registered HP-1070 to Patricio Janson, Panama City in April 1986, (he was in fact the Minister for Civil Aviation in Panama, and the Otter was evidently registered to him to facilitate its sale in the United States). It was sold in the United States the following month, being registered N254A to Aviation One Inc of Cincinatti, Ohio in May 1986. At that stage of its career it had 4,072 hours total time on the airframe. In February 1987 it was registered to Lyle E. Goodwin of Titusville, Florida and used for skydiving. It was painted in a most flamboyant colour scheme of white fuselage with thick red and blue cheatlines and adorned with dozens of white stare. It was noted visiting the “Sun and Fun” fly-in at Lakeland, Florida during April 1988. In February 1989 N254A was sold to Rainbow King Lodge Inc., of Iliamna, Alaska and headed north. It was painted into the company colours of white fuselage, red cheatline and blue under-fuselage, with blue/red on the tail. It flew alongside Rainbow King Lodge’s other two Otters N61FE (61) and N100BW (58), to transport their fishing lodge guests. In May 1991 the Otter was sold to Thomas J. Prijatel of Cordova, Alaska and the registration changed to N254AW. He was the owner of Alaska Wilderness Air and Alaska Wilderness Outfitting, which operated the Tsiu River Lodge, one hundred miles south-east of Cordova. The Otter would fly for these companies, transporting their fishing and hunting guests, as well as tourists on rafting trips and on general charter work. The Otter was put on floats and joined the company’s fleet of a Beech 18 on floats, Beaver and several Cessnas. The company also ran a unique operation, offering guests a week long fishing tour taking in all of Alaska. The Otter and the Twin Beech would set off with a total of six guests, two pilots and a cook and the itinerary would be decided as the trip progressed – “Each night will be spent comfortably camping in a different section of the State amidst scenery you will long remember. Around the campfire each evening, the next day’s itinerary will be mapped out – the Yukon River, the Brooks Range, the Kobuk River, Bristol Bay, Lake Iliamna, the Valley of 10,000 Smokes, the Alaska Range, Wrangell Mountains, Prince William Sound, the Kenai Peninsula – our idea is to get you out to see the Alaska wilderness that few people get to visit”. These activities took place during the June / September summer season. During the winter months, the fleet headed south, to Lakeport on Clear Lake in northern California. There the aircraft were maintained, attended sportshows promoting the Alaskan fishing trips and were also available for seaplane training, the Beaver at $250 per hour, the Otter at $350 and the Twin Beech at $375. This pattern of operation continued for some years, until the around-Alaska trips and the Californian deployments were discontinued, and the Otter was based at Cordova and used to service lodges and fishing camps from there during the summer months. It was put into storage during the winter. It came to grief on 7 September 2001 while on a flight from one of the lodges, located 100 miles south-east of Cordova, back to Cordova carrying eight guests and the pilot. The Otter was on wheels. While in level, cruise flight a loud bang was heard and the engine began to run rough and lose power. Smoke entered the cabin and oil pressure was lost. The pilot made a forced landing in a marshy, muskeg-covered area at Controller Bay near the Bering River Flats, 53 miles south east of Cordova. The Otter nosed over and sustained substantial damage to the right wing, engine firewall and empennage. The pilot sustained minor injuries but remarkably none of the passengers were injured. The emergency was responded to by a United States Coast Guard HH-60 Jayhawk helicopter, from the Coast Guard Cordova base. It homed in on the ELT signal. A private aircraft flying in the vicinity also went to the assistance of the downed Otter, spotted the crash site and provided the Coast Guard crew with its position. Both the Jayhawk and the private aircraft landed near the overturned Otter. The Jayhawk lifted six of the nine on board the Otter to hospital in Cordova and the private aircraft, the “Good Samaritan”, took the other three. The Otter lay in the bog for a few weeks until a Bell 204 helicopter was used to retrieve it. Bell 204 N70NW of Northern Pioneer Helicopters airlifted the Otter out of the bog and transported it as an underslung load to Big Lake, Alaska, north of Anchorage, for repairs. Here the Otter was repaired and restored to flying condition. It then had 8,838 hours on the airframe. 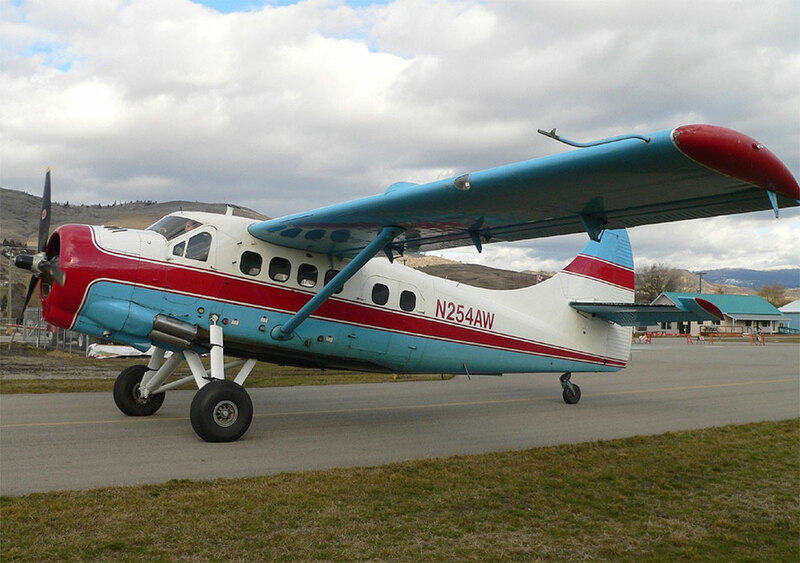 N254AW continued in service with Alaska Wilderness Outfitting as a piston Otter, flying out of its Cordova base, until February 2006, when on 5 February it arrived at Vernon, BC to be converted to a Texas Turbine Otter, with the Garrett engine, by Kal-Air. This work was performed over the subsequent months, being conversion number 25. On 7 July 2006 the Otter departed Vernon to return to Alaska. It landed without radio contact that day at Smithers, BC. It resumed service out of Cordova. The turbine-engined Otter proved most popular with its passengers. As one fisherman wrote: “This plane had a radial engine which was recently replaced by a turboprop. Loaded with nine passengers, all their gear and all their fish, it was off the ground from a wet sand strip at the Tsiu River in ten seconds and under fifty yards. A remarkable plane, perfect for these operations”. It was noted at Big Lake, Alaska undergoing maintenance in May 2008, in preparation for that year’s summer season. As of summer 2017 N254AW is still in service, its 26th year of operation with Alaska Wilderness Air.